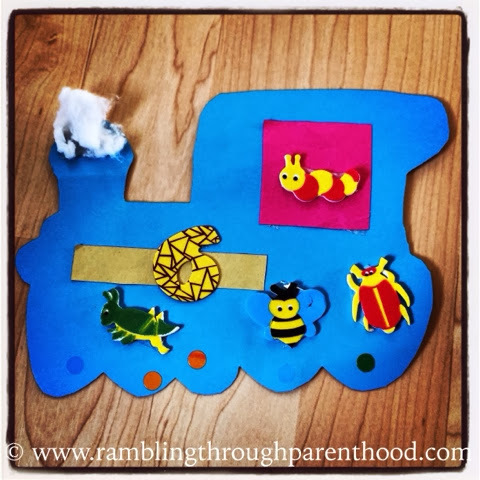 Rambling Through Parenthood : Super! Super! That is my word of the week. And why shouldn't it be? After all, it was this week that J said, "Super!" for the first time ever. Everything else that transpired this week pales in comparison to that one word - Super. Come to think of it, every day this week could easily be summed up in that one word. Not every waking moment (or sleeping, for that matter) was necessarily super. But every cloud has a silver lining if you choose to look for it. This week, I chose to look for the silver lining. Just because my son said, "Super!" Friday - was pizza-night with Fracture, an edge-of-the-seat Hollywood thriller, thrown in for good measure. Nothing could be more super. Saturday- We up-cycled a used box of tissues and created a super - duper robot. Sunday- Our visit to the Imperial War Museum had me all shaken up, but J had a super time riding on the trams. Monday- J went to pre-school without shedding a tear. I have waited 5 weeks for this day. Super! Tuesday- J was poorly, but chirpy. He drove me crazy by staying up well past midnight. And then he snuggled up to me and we both managed a super sleep. Wednesday - J said, "Super!" when he was in the middle of a session of rough and tumble with M. The first time ever that he has used the word to describe something he was doing. Thursday - M got me a bunch of pink roses as he is working late tomorrow. And some heart-shaped chocolates. Valentine's Day came early! Super. So there you have it. An entire week where, if I choose to look, I find something really super in the midst of all the chaos, all the commotion and all the emotion. I did, thank you. Fracture surpassed all expectations, to be honest. I wasn't really sure about it, going by the name. But would strongly recommend it to everybody now. A great word! What a wonderfully super week you have had! What a wonderful week you've had! I was thinking of taking mine to the Imperial War Museum this week, would you recommend it? If they are a bit older and learning history at school, they will probably love it. Mine is too little, so couldn't really understand most of it. And what a smashing word that is ! Super is such n underused word these days. I've just bought Archie a "Superman" T as we've been saying more frequently too!! I think it is a nice enough word for little ones to learn :-) Nothing wrong with a bit of super to brighten up the day! I'm glad that you all seem to have had a really super week. Hope there are many more to come! What a lovely post - and a great word!